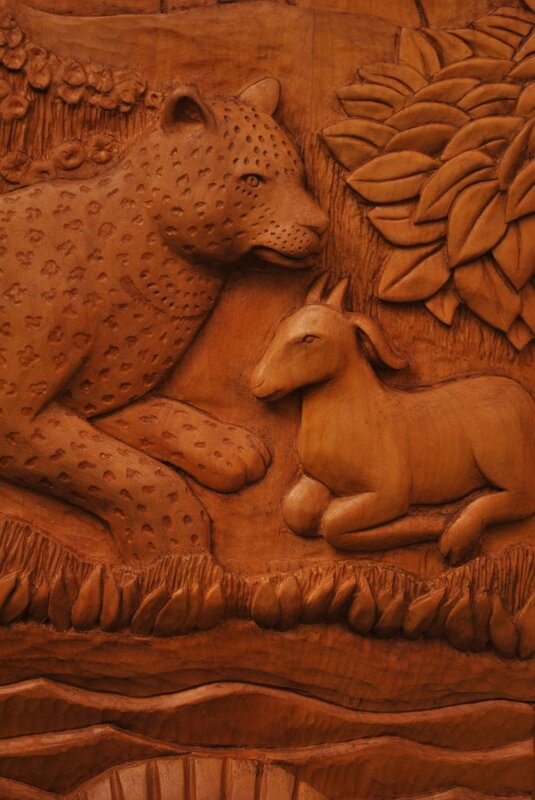 Christ Church Cathedral in Cincinnati commissioned me to carve this basswood relief sculpture for its Centennial Chapel. It is the pinnacle, so far, of my religious art work. The main idea is from Isaiah 11 with the overall theme being the coming of peace & prosperity to the world. In Isaiah, the lion lies down with the calf, the wolf with the lamb, & the leopard with the kid (goat); & a child shall lead them. Those are the central figures in the 3 largest panels. The two smaller panels depict a sword beaten into a plowshare, & spears broken & turned into pruning hooks harvesting grapes, symbolic of prosperity & abundance. In the distance 7 mountains (hills) allude to Cincinnati, and also to mountains associated with God--like Horeb, Sinai, Zion, & the Temple Mount. In the middle background people join in a line dance representing humanity living in harmony. The song, “Down By the Riverside (Ain’t Gonna Study War No More)” inspired the river motif, another reference to Cincinnati, but also to the Jordan River, allowing a representation of the baptism of Christ, symbolized by the Fish, the descending dove, and the shells. 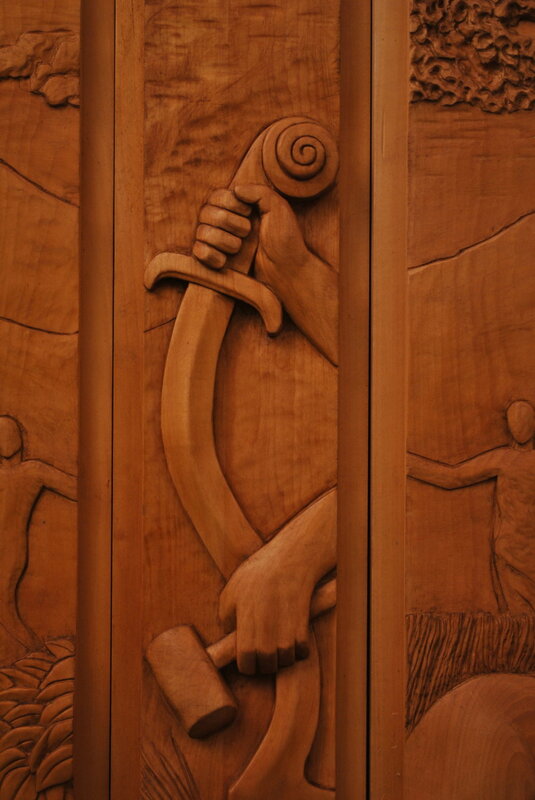 I spent 5 months working on the design: first with committee discussions; then loosely rendered concept drawings, then a precise, half-scale, clay model for committee approval, before I started carving wood. I spent eight months doing the actual carving. The top photo is in its own separate page, but with the detail shots below it, you can navigate from picture to picture without returning to this page. Size: Central panel: 70 x 31 inches. Outer panels 70 x 14 inches each. Small panels 4 x 6 inches each. Deepest relief: 3 inches. Mounted on the reredos: 70 x 88 inches.